This 1936 version, directed by Anatole Litvak, was popular with critics and audiences alike. The usually reliable director Terence Young's 1968 remake was good to look at but dull and unconvincing. French director Jean Delannoy's 1949 take on the story combined good production values with pace and flair. What happened at Mayerling Lodge, 1889? 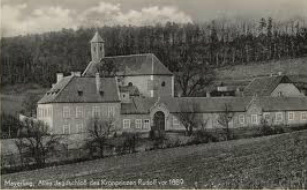 Mayerling Royal Hunting Lodge, 1889. The body of Crown Prince Rudolf. In January, 1889, Prince Rudolf, the heir to the throne of Austria-Hungary, then an enormous but disintegrating empire in central Europe and the Balkans, was found dead at Mayerling, in his large and opulent hunting lodge. Also dead was his current mistress, seventeen-year old Baroness Mary Vetsera. Both died of gunshot wounds to the head. The deaths were apparently the result of a suicide pact.However, so important was the Austro-Hungarian strategic and dynastic role in European politics that the death of the heir to the throne was a matter not just a source of gossip and speculation. It was also a matter of intense political and diplomatic significance. Matters were further complicated by the fact that the new heir to the throne, the Emperor Franz-Josef's younger brother Karl Ludwig renounced his rights to the imperial throne in favor of his son Franz-Ferdinand. He was assassinated 25 years later at Sarajevo, the event that precipitated the start of the first World War. The events at Mayerling have retained a fascination for those fascinated by royal marital infidelities, conflicts and jealousies within ruling families and o conspiracy theories. In these respects the Mayerling deaths were the late nineteenth century equivalent of the Prince Charles/Lady Di affairs a century later. This probably explains the lingering interest in Mayerling and the fact that at least three films, several TV productions, a couple of ballets and an opera or two as well as several musical videos have been made about the lovers. 1. It was a double suicide committed out of love / despair by a couple who realized that their romance would never receive religious, civic, political or familial approval.This is the simplest explanation and no convincing evidence exists to contradict it. 2. It was a political assassination ordered by forces in the Austrian Hungarian empire who feared Rudolf's more liberal, democratic outlook and his more relaxed attitude towards dissident minorities in the empire, especially the Magyars (Hungarians). Some accounts allege the complicity of his father, the Emperor. Or the deaths might have been ordered by Germany or France, eager to exploit the dynastic uncertainties created by the death of the heir. Again, no proof exists. 3. It was a murder carried out on the orders of his father, who was allegedly furious with Rudolf for refusing to abandon his liaison with Mary Vetsera. 4. Rudolf and his mistress were killed for his refusing to take part in a plot to overthrow his father, and threatening to reveal the conspirators. 5. Rudolf was himself plotting to overthrow his father and was killed in retaliation. Aged thirty at the time of his death, Rudolf had a depressive and agitated personality, and a drug addict. He and his wife were on very bad terms, but the Catholic church would allow him a divorce. His relationship with the teenager Mary (Marie) Vetsera was an open secret and a source of anger to his irascible and reactionary father, the Emperor Franz-Josef. Father and son also disagreed bitterly over political matters, especially the vital issue of the future of the huge but disintegrating Austrian-Hungarian empire. Rudolf apparently favored a liberal and democratic approach, hoping to modernize the empire and so prevent its disintegration. His father preferred to continue his traditional policies of repression combined with a refusal to accept the need for profound change. Born in 1830, Franz-Josef was only eighteen when he came to throne in 1848 in the midst of the tumultuous rebellions of 1848. He remained Emperor of the Austrian (soon to be Austrian-Hungarian) empire until his death in 1916. Throughout his reign he faced increasing discontent from Slavic groups in the empire, especially Serbs, who demanded increased powers, even independence. The Emperor gave in to conservative Germans and Hungarians who opposed any form of power-sharing with these races. This policy placed him in opposition to Russia, traditional protector of Slavic peoples. Also,the imperial determination after 1866 to increase Austrian influence in the Balkans meant that great power competition for dominance in central Europe and the Balkans was creating a powder-keg. This exploded in 1914 with the assassination of the Emperor's heir, Franz-Ferdinand. Ava Gardner and James Mason as Empress Elizabeth and Emperor Franz-Josef in Terence Young's dreary 1968 version..
Gardner's Empress Elisabeth and Omar Sharif as Crown Prince Rudolf. 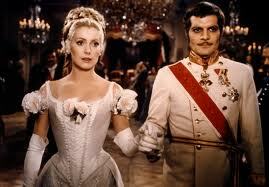 Catherine Deneuve as Mary Vetsera and Sharif as Rudolf. Note the blatant copy of a romantic pose from the recent and hugely successful 'Dr Zhivago'. Charles Boyer and Danielle Derrieux in the classy 1930s' version. Jean Marais and Dominique Blanchar as the lovers in the 1949 French movie 'Le Secret de Mayerling'. The excerpt on right shows the elegant and restrained style of the movie, a clever contrast with the intensity of the subject-matter. Litvak's approach to the events at Mayerling is straightforward. He treats the affair as a suicide rather than political murder. The Rudolf-Mary relationship is doomed because of imperial politics, Rudolf's marriage and family pressures. 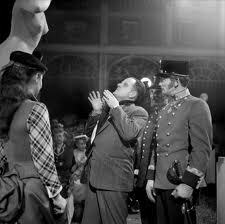 While Rudolf is presented as likable and charming, the film also regards him as somewhat dissolute and impulsive. Relatively little time is devoted to the clash between the reactionary politics of the royal court and Rudolf's apparently more liberal outlook. The love affair is what matters in this version, and its intensity is focused by the elegant and romantic camerawork and photography, and the convincing performances of the two stars.The recent issue of a DVD version of Litvak's black and white movie reveals a fine film made by a director whose main claim to fame has been his noirish Hollywood films made from 1940 to 1948. Some of these films are dramas with distinctively big-city locales. They include 1941's Blues in the Night, Out of the Fog (1941) and the suspenseful Sorry, Wrong Number, made in 1948. That year also saw the realize of Litvak's harrowing The Snake Pit, the first Hollywood movie that dealt meaningfully with the issue of mental illness.During the war Litvak had enlisted in the military, working with Frank Capra on the famous Why We Fight documentary-propaganda series. After 1948 Litvak returned to his native Europe, where he made a few movies during the fifties and sixties. Most, however, lacked the distinctive edge and style of his work from 1936-1948. Anastasia, made in 1956 with Ingrid Bergman playing a woman claiming to be the only surviving Romanov was critically and commercially successful. Before that film Litvak had lived a fascinating life. Born in the Ukraine to Jewish parents, he worked as an actor in St.Petersburg while a teenager. After the Russian revolution he turned to cinema in that city, gradually becoming a director of short features. But in 1925 Litvak moved to Berlin, working in film studios there, eventually becoming a director of German feature films. 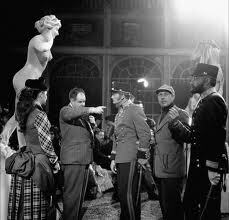 With the Nazis rise to power in 1933 he moved to France, where in 1936 he directed Mayerling. It became a hit both in Europe and in the USA. He then moved to Hollywood, working in contract for Warner Brothers 1937-1941. 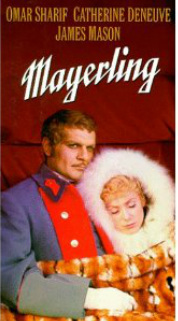 Anastasia, in subject-matter and theme, was something of a throwback to Mayerling, the film that made his reputation. Still of the suicide scene from Delannoy's version of the Mayerling affair. Delannoy on set of 'Le Secret'. Another shot of the director on set with his two stars. Delannoy's 1949, only recently re-released in France, suggests that the famous double suicide was in fact a political murder, carried out by a German assassin.According to the film Germany was concerned that Rudolf was planning to overthrow his father's rule, in league with shadowy elements from Russia.He was supported in this by Mary. Rudolf is depicted as liberal, idealistic and resentful of his father, the Emperor.And so the pair had to be removed, presumably to ensure the stability of the Austrian-Hungarian empire and of central Europe. The movie portrays the affair as a doomed romance between a reckless prince, who though hardly a model of sexual constancy, was angry with the social and political conservatism of the royal court and in love with a rather naive and highly attractive young woman, out of her depth in the intrigue of the court. Terence Young was a fine director of action movies - he made great James Bond movies, but his talents were unsuited to romantic melodrama. 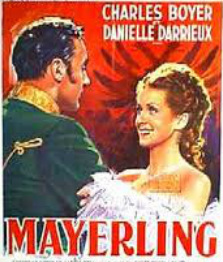 British director Terence Young's version of the Mayerling scandal owed much to the recent success of David Lean's Dr Zhivago. 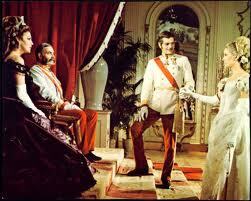 Like that film, Young's Mayerling sets a story of doomed love against a background of important historical events. 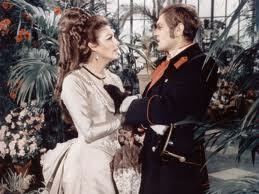 And like Dr Zhivago, Mayerling opts for lavish settings, lush music and spectacular photography. Unfortunately, the 1968 movie is dull, turgid mess. Omar Sharif's performance is wooden and the usually charming and effervescent Catherine Deneuve is listless. Even James Mason as the Emperor is subdued. The movie's takes on the Mayerling saga claims to use recent shocking 'historical' evidence that reveals the 'truth' about the affair. However, its approach is predictable. Rudolf is depicted as an idealist, genuinely in love with a woman despised buy the royal court, holding democratic and modern values, victim of a loveless marriage, and trying to resist the politics and influence of his arrogant and reactionary father-emperor, while being very fond of his mother. The movie presents the pair as the victims of political opponents, yet the ending opts for double suicide rather than political murder. Terence Young made his name during the 1950s and early 1960s as a director of action films. These included The Red Beret (about paratroopers) and Storm over the Nile in the early fifties. In the early 1960s he directed three Bond movies -the first, Dr No, then the best of all Bond movies, From Russia With Love and then Thunderball. But his career then went downhill, apart from 1967's thriller Wait Until Dark with Audrey Hepburn. The sequence below illustrates the expense and glamour that charcuteries Young's version.